As you guys might have noticed by now, I tend to visit Moscow quite frequently. My parents live there with my little brother and I usually go back there twice a year and they come here once or twice. Because I was still bon under USSR and my parents were too, Russian was the most common spoken language, and even though I grew up in the Ukraine (and my parents in Moldova) all of us were brought up speaking Russian as our first language. I didn’t actually visit Russia until 2009 when my parents moved there, a little weird isn’t it? 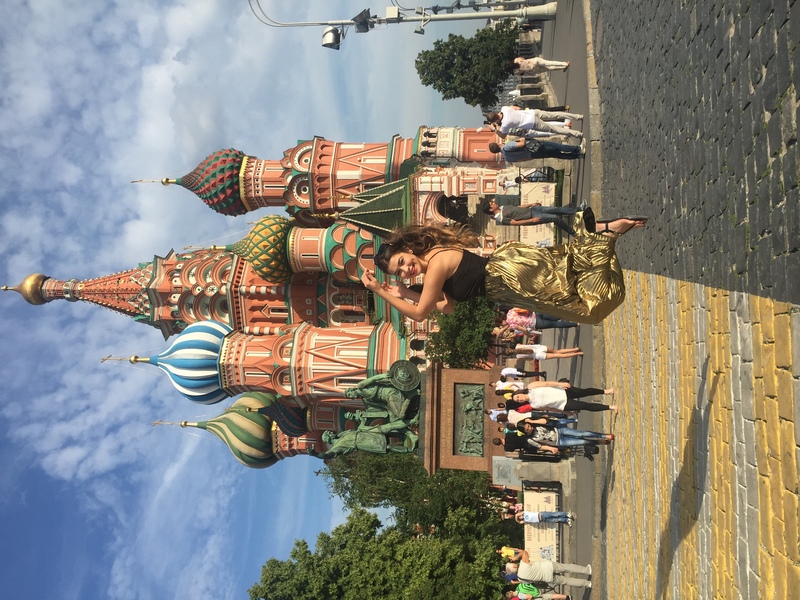 Today I thought I would compile my Moscow Travel tips for you, the way I did with my Paris ones (I plan on doing it for every country I visit).I also often get asked the same questions about visiting Russia that I thought I would also answer here. How long is the flight and what are the visa regulations? – Depending on which airline you fly, but all together the flying time is roughly 12-13 hours. I don’t know any airline that does a direct trip, so you will need to do stopover of some sorts. I usually fly Etihad that has a couple of hour stopover in Abu Dhabi, or Emirates with a stop in Dubai. The visa regulations are different for every country, but yes you will most probably need a visa. But isn’t it always cold?– If I had a cent for every time I get asked this question I would be super rich by now. Contrary to popular belief, it is not always cold in Russia, especially in Moscow. During the summer months (June-August) it actually gets pretty hot, hotter than in does in South Africa. However it is quite chilly in winter- the worst I’ve experienced was -10C, but honestly everything there is equipped for the cold. It is super warm inside, so the only cold you will get is running to and from a car/bus/subway. This is mainly in Moscow, because if you travel east of Russia to Siberia, yes it does drop to -40C in winter. I don’t suggest you go there for leisure ;). If you are visiting in summer pack a light jacket and a pair of jeans as a precaution for when it rains, and that will be enough. If you are travelling in winter, pack stockings to wear under your jeans and puffy jackets- those tend to keep you quite warm. Does everyone only drink vodka?– Another stereotype, which I get asked a lot. I don’t drink very much at all, and people always give me a shocking look when I tell them that I hate vodka. It is the most popular alcohol beverage in Russia, and yes a lot of people drink it, but there are a variety of alcohol beverages available anywhere you go, so no you won’t just be stuck with drinking vodka the whole time ;). Is there public transport?– Yes and a lot of it. Subways, trains and buses all operate very efficiently. However I think Moscow is for walking, especially if you want to experience it. 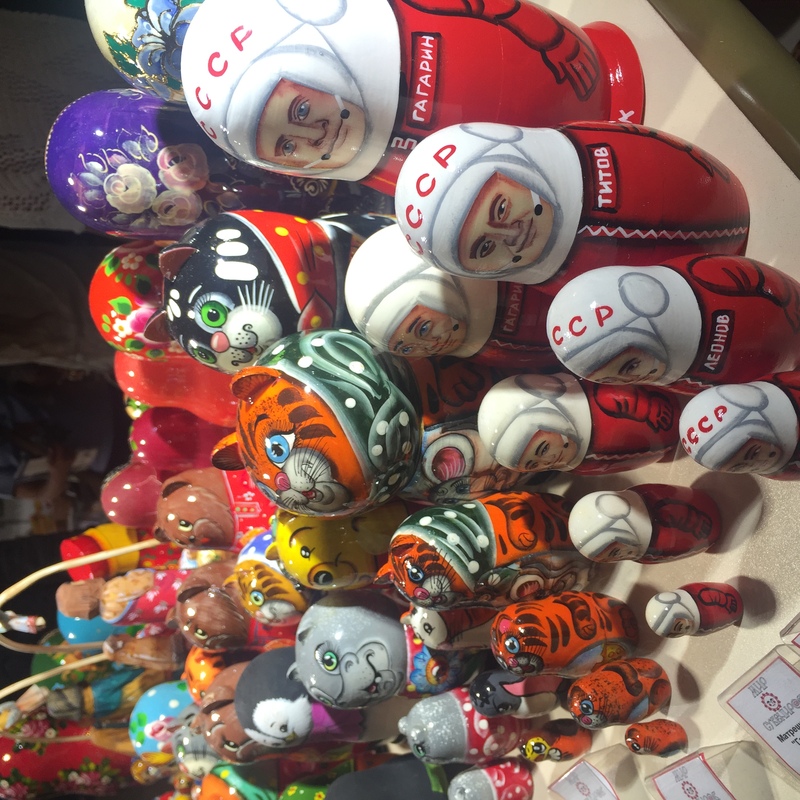 I love the Old Arbat Street that is filled with souvenir shops and little Russian cafes, and make sure you walk along Tverskoy Boulevard- a business street that leads to the Red Square. The architecture in Moscow is beautiful so make sure to stop and admire it from time to time. I wouldn’t suggest taking the subway unless you are very desperate as it is complicated and gets super full during peak hours. Do Russians speak English?- Yes but not many and not well, so make sure to take a little translator with. What souvenirs should I get? – I love the traditional Matreshkas (nesting dolls) because they don’t only come in one pattern. Nowadays you can get Matreshkas with any design- last year I bought my boyfriend a Liverpool Team Matreshka, that had Steven Gerrard as the big Matreshka, and 5 of the other Liverpool players as the smaller ones. Gosh I’ve seen a Beatles one, a past Russian presidents one and even a One Direction one (not joking). 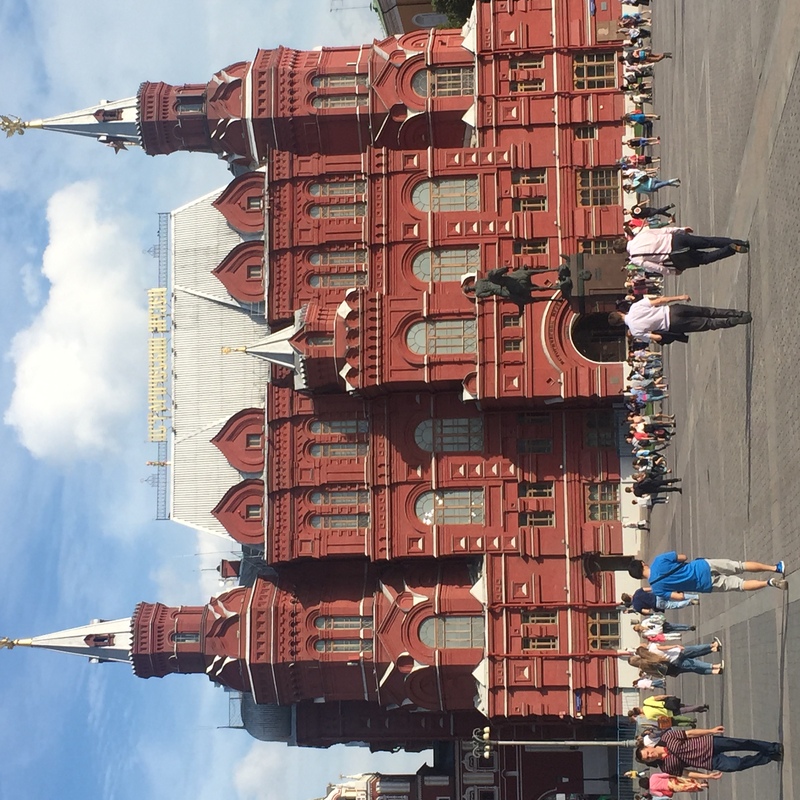 What is there to see?– You can check out my post on my Top 5 things to do in Moscow here, but definitely visit the Red Square (its free) and have an ice cream there. 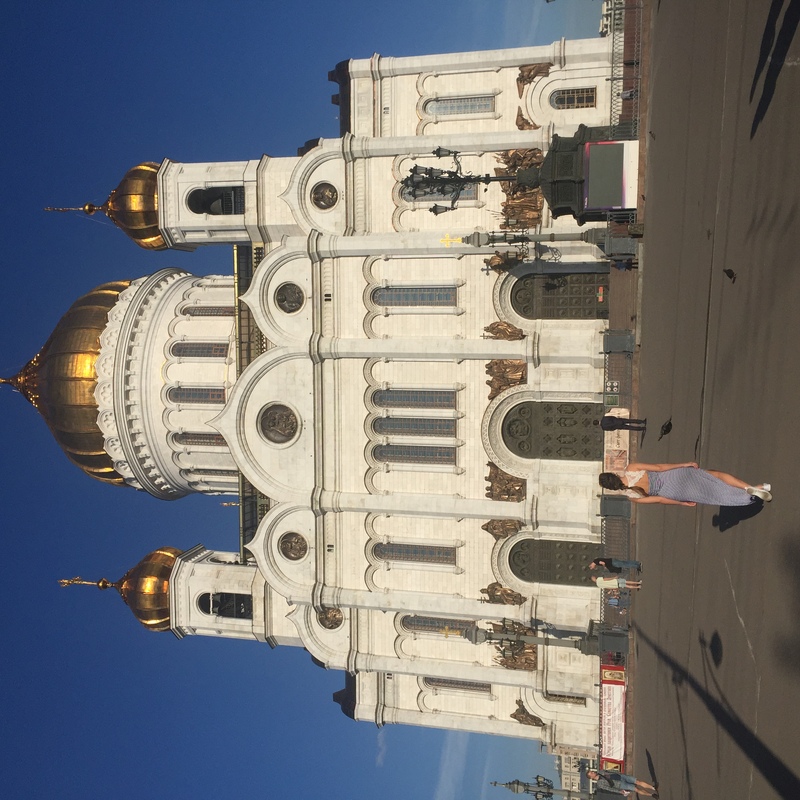 If you love beautiful Cathedrals then make sure to see the Cathedral Of Christ The Savior (also free entrance). There are lots of museums if you love art and the entry fee is usually very little, the maximum I have paid is R150(15$) (students also get discounts if you present your student card). What’s the food like?– DELICIOUS! I love me some Russian food and even though Moscow is bursting with fancy Italian and Chinese restaurants, as well as most franchises, please give those a skip and go try some traditional Russian food. Borz, “Herring in Fur Coat” (a salad of herring under layers of beetroot, potato and carrots), Blini (crepes), Pelmeni (big meat ravioli) and Kompot (a home made berry juice) are just some of my favorite things. But even if you are not adventurous there are lots of Burger Kings, Wendy’s and Starbucks there for you. 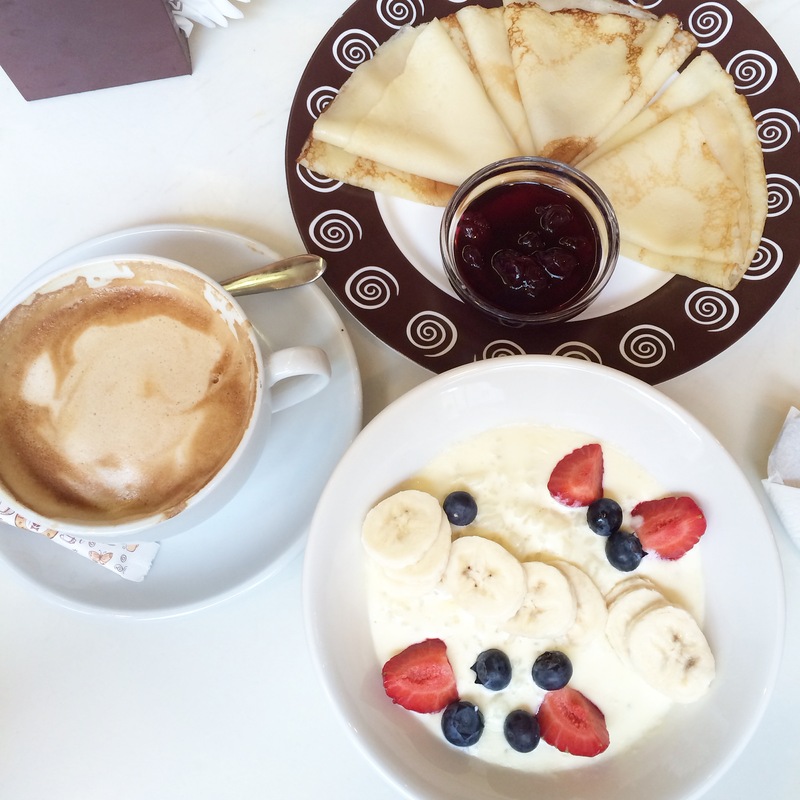 My favourite breakfast of rice porridge with fruit and Blini with Cherry Jam. I have such a sense of Wanderlust right now.. I have to visit ? ?